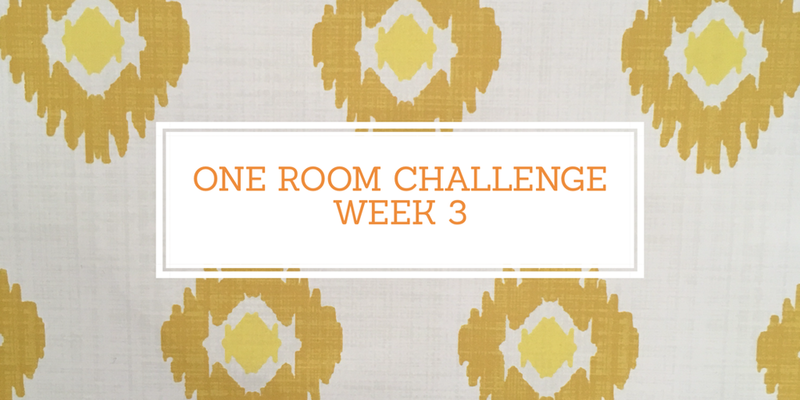 It's the halfway point of this challenge, and I'm officially a day late and a roll short. Let me explain... If you're a ORC fanatic you'll know that updates for guest participants get linked up on Thursdays. Well it's Friday, and I'm just now catching up. As it turns out, having a newborn and a toddler, running a business, and attempting to be a functioning member of society is a *little* exhausting. Sometimes something just has to give, and for me it was that Thursday deadline. C'est la vie! That being said we made some real progress this week, and aside from one mishap, I'm feeling totally optimistic. Since the wallpaper was removed the week before, the goal for this week was to paint and add an accent wall. 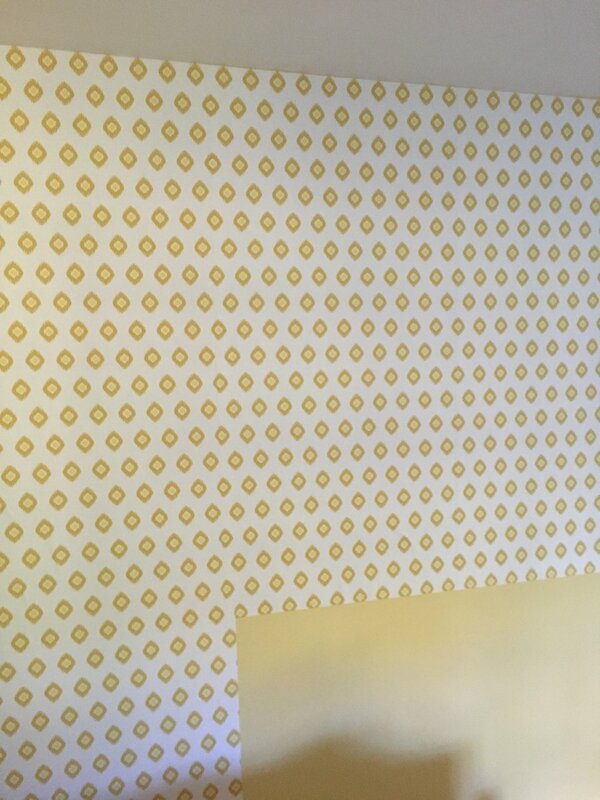 My niece wanted yellow walls, and since she is steering this design plan that's what we went with! Both my sister and I had a yellow bedroom at different points of our childhood, so it felt like a sweet passing of the torch that she will now have a yellow bedroom as well. We went back and forth on different shades, some brighter, some more muted, and we eventually landed on Hawthorne Yellow by Benjamin Moore. 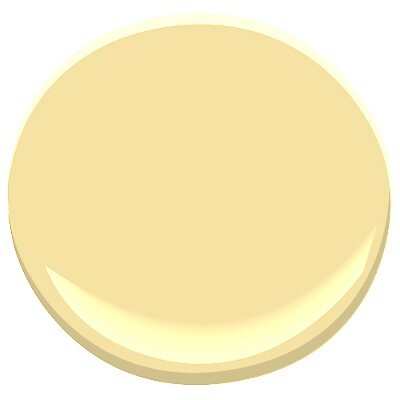 It's super buttery and sunny while being soft enough that it works well in a relaxing space. In addition to painting the walls, we wanted to add in an accent wall to go behind the bed. I found a beautiful ikat wallpaper from Wallshoppe and we all instantly fell in love with it! It really works to help reinforce the global feel of the space as well. Best of all, it is removeable, so if she decides she doesn't like it in a few years, they can just pull it off without any of the mess or hassle of traditional paper. We shipped the wallpaper directly to my sisters house and when I arrived I realized we had a big problem; there wasn't enough! DO NOT, I repeat DO NOT ever attempt to calculate sq footage and estimate wastage when you have not slept in many months. The end result will be coming up short and having to beg a company to try and expedite more rolls to you (fingers crossed!!!). Huge error aside, we started to hang the paper and it is gorgeous! We decided to do it ourselves and the process is kind of like applying a giant sticker. The pattern we chose has a straight repeat which made it a little easier, but it was definitely a process trying to getting perfect alignment. Since there is so much white space, any error really shows up and has to be corrected. Disclaimer: staring at an ikat pattern for hours at a time will make you cross-eyed. Especially, as noted above if you have not slept for months. progress shot! we're about 70% done, and will hopefully finish the rest next week. So that's where we're at right now. Next week our goal is to go furniture shopping. The best part about doing this project for my neice is that it gives my sister and me a fun excuse to plan shopping trips and spend extra time together. That definitely makes this whole project worth it! Make sure to follow along with the other guest participants here. I can't wait to see everyone's transformations in just 3 more weeks!